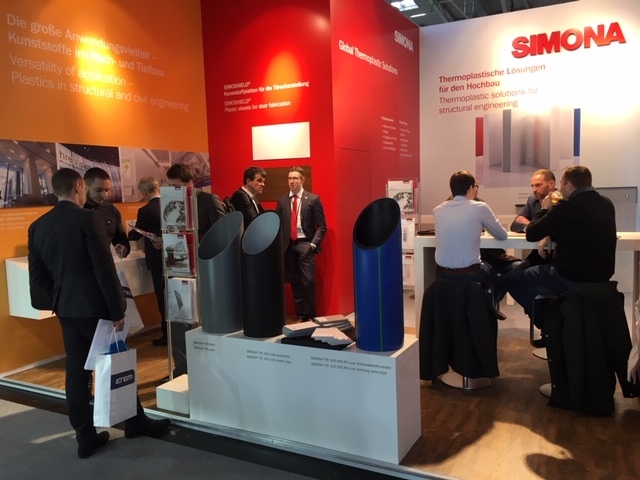 SIMONA will be presenting its product range for the construction and advertising industries at this year’s BAU trade fair (Hall B5, Stand 530). SIMONA® products for construction components include compact and foamed sheets, pipes, fittings and finished parts. SIMOSHIELD is our range of PVC-T sheets with decorative foils and a visible and palpable woodgrain finish. SIMOFLOOR is a core sheet for multilayer flooring. The moisture-resistant material does not swell when exposed to water, so it is also perfect for applications in damp rooms. SIMOPOR CONSTRUCT, the lightweight construction sheet, impresses with its low weight and high stability. By using recycled materials, we apply a closed-loop approach and deliver a sustainable and cost-effective alternative to traditional solutions made of wood and metal. Clean air and a comfortable room climate are key contributors to people’s sense of well-being. SIMONA supplies pipes and fittings made of PP and flame-retardant PPs for industrial ventilation systems and extraction engineering. Plastic ventilation systems are lightweight and easy to install. We are also highly experienced in manufacturing finished parts to suit your specific needs and applications. Based on our own premium quality semi-finished products, we can quickly and cost-effectively customise the finished parts to your specifications, for example impact protection strips made of SIMONA® PE 1000 for use in hospitals, supermarkets and DIY stores.